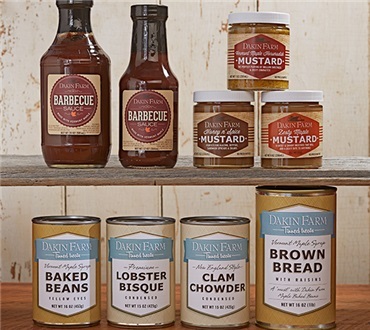 We've captured the flavors of our favorite, timeless New England recipes and packed them into convenient tins for you to have on hand and enjoy. Maple Baked Beans, 16 oz. Brown Bread with Raisins, 16 oz. WATER, LOBSTER MEAT, MODIFIED FOOD STARCH, SHERRY WINE, TOMATO PUREE, RICE FlOUR, UNBlEACHED WHEAT FLOUR, NATURAl LOBSTER FlAVOR, WHEY, BUTTER, SUGAR, MALTODEXTRIN, SALT, VEGETABlE SHORTENING(SOYBEAN OIL AND COTTONSEED OIL) XANTHAN GUM, OLEORESIN, PAPRIKA, WHITE PEPPER, CELERY POWDER, ONION POWDER, NATURAL FlAVOR, RED PEPPER, THYME, BAY LEAVES AND NUTMEG. I always make sure I have some on hand. These beans pair well with all of Dakin Farms smoked meats! They are the BEST baked beans on the market! The lobster bisque is simply awful. The beans and brown bread SCRUMPTIOUS. Cabot Cheese DIVINE...but save your money on the lobster bisque, it tastes like cat food smells. No lobster in it and brown gel-like fishy taste. Adding the milk/cream was a total waste of additional money. Absolutely the best baked beans I've ever had! The baked beans are awesome! Not overly sweet, and the bean choice is 10000x better than the standard canned baked beans.